The metro station in Sofia downtown may soon happen to house the residence of Byzantine Emperor Constantine I. The archeologists have not confirmed for sure the identity of the findings as excavations continue. All facts for now, however, lean towards the variant that the palace of the first Christian Emperor lies just under the square in front of St Nedelya Church. Yesterday Bulgaria’s Minister of Culture, Vejdi Rashidov and Sofia Mayor, Yordanka Fandakova presented the latest archeological findings. A unique dwelling and a church from the 4th century have been the most recent sensation that came up from Sofia’s underground depths. 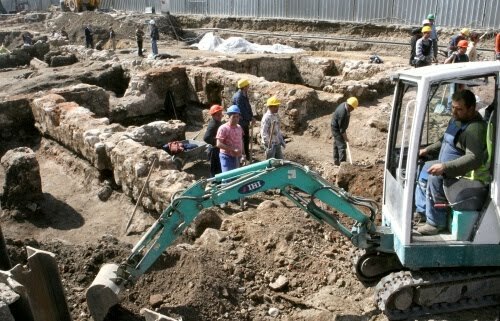 “The well-preserved building must have belonged to a noble citizen of Serdica,” explained archeologist Mario Ivanov from the Bulgarian Academy of Science. There is a bathroom, yard and a bakery in the building. The most precious finding, however, is the 30sq.m of mosaics. Such a large mosaic preserved with all the ornaments is vary rare to find, so far only separate parts have been discovered, experts commented.